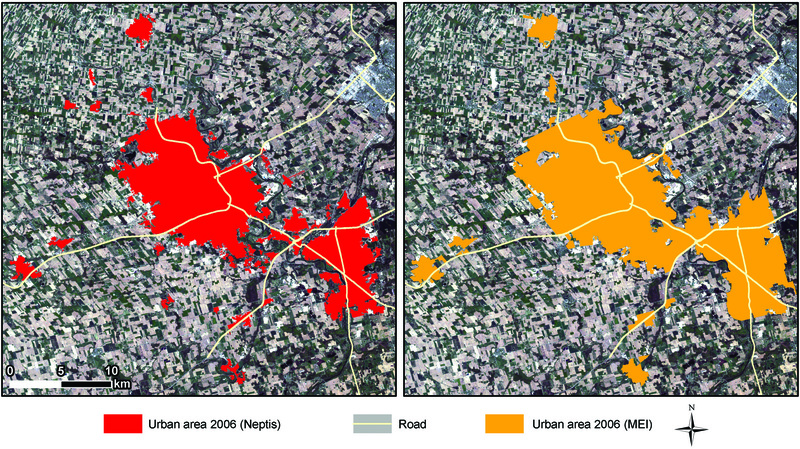 Figures 5a and 5b juxtapose the 2006 urban area data set derived using the Neptis procedure (on the left) and that created using the provincial method (on the right). On the whole, the data sets look very similar. The main differences can be attributed to differences in the original data used to produce the boundaries. Neptis's procedure employs satellite imagery, so that a 30 ? 30-meter square image pixel (the smallest unit in an image) is its basic building block. The Province, on the other hand, uses the property assessment database and the Ontario parcel database as its source data, whereby properties or individual land parcels are the basic building blocks for creating the built boundary.14 In the Neptis method, "urban" is identified as hard surfaces as seen from space; whereas in the Province's method, "urban" is determined by land use codes in property assessment data. A parcel and a pixel contain both built and unbuilt land. Neptis's image-based procedure classifies built land based on the percentage of impervious surface (hard or built surfaces) in a pixel. By comparison, the province deems a parcel urban or non-urban depending on the land use classification in the property assessment database. Both approaches use a method to fill non-urban holes within the built envelope. However, the Province has left some holes inside the urban areas that are greater than 35 hectares. 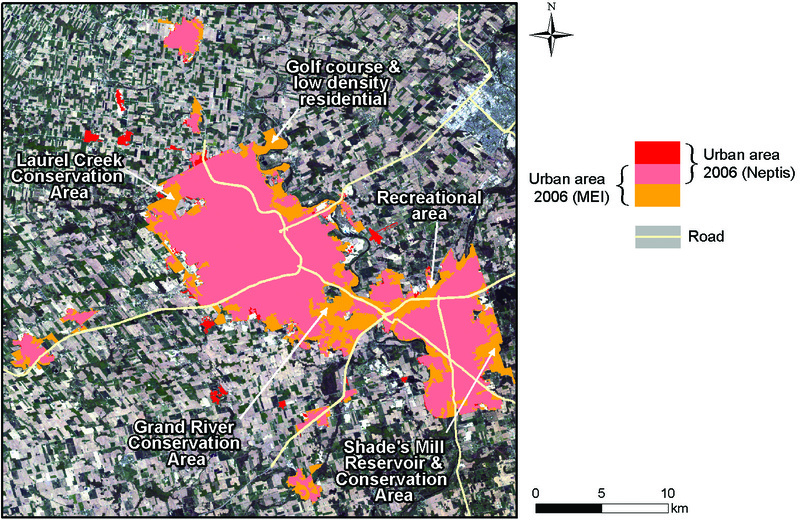 These areas tend to be large urban parks or conservation areas--areas that are unlikely to be developed. A limitation of our method is that the land uses on the edge that contain large greenspaces--such as golf courses, parks, conservation areas, and low-density developments with mature trees--cannot be automatically detected, since the percentage of impervious surface in these areas is low. Thus an image-based approach produces a slightly smaller urban land base than a parcel-based approach. Nevertheless, the exclusion of these areas does not affect the intensification rate, since most of these green spaces will never be built on. The Province will also be using its built boundary to measure and implement a second policy in The Growth Plan for the Greater Golden Horseshoe: the greenfield density target. This target requires all new greenfield development in a municipality to be built at a density of 50 people and jobs per hectare. For this reason, it makes sense for the Province to include large, undevelopable greenspace at the edge of the 2006 urban area in its built boundary data set, since these areas, if included in a greenfield density calculation, would lower the overall density. Our image-based method has one big advantage over the parcel-based method, however. The method can be employed to examine historical rates of intensification region-wide. This is very difficult to do with the Provincial method, since the current form of the parcel data has been made available only recently. Figure 6 provides a direct comparison of the two sets of results. Pink indicates where the two boundaries coincide, red indicates where the Neptis boundary extends beyond the Province's boundary, and orange indicates where the Province's boundary extends beyond the Neptis boundary. It is mainly the green areas at the urban edge where differences lie. The labels indicate land uses where the largest differences are apparent. The Province has excluded from its boundary any built-up areas that are not serviced by municipal water and sewer services, such as small hamlets. The Neptis boundary captures some, but not all, of these areas. In any case, these areas are not likely candidates for intensification. 14. Ministry of Public Infrastructure Renewal. Technical Paper on a Proposed Methodology for Developing a Built Boundary for the Greater Golden Horseshoe (Toronto: Government of Ontario, November 2006). Ministry of Public Infrastructure Renewal. Technical Backgrounder: Technical Paper on Developing a Built Boundary for the Greater Golden Horseshoe (Toronto: Government of Ontario, November 2006).